The nose is the part of the respiratory tract that sits front and center on your face. You use it to breathe air in and to stop and smell the roses. The nose’s exterior anatomy includes the nasal cavity, paranasal sinuses, nerves, blood supply, and lymphatics. The external part of the nose includes the root (between the eyes), the dorsum that runs down the middle, and the apex at the tip of the nose. Two openings called nostrils (nares) allow air in. They’re divided by the nasal septum (dividing wall of cartilage and bone), and the parts that surround the nostrils are called the alae (ala singular). The nose has a bony part that’s formed by the bony nasal septum, the nasal bones, and parts of the maxillae, palatine, and frontal bones. The cartilaginous part of the nose is formed by two lateral cartilages, two alar cartilages, and a septal cartilage. Roof: The roof is divided into three parts: frontonasal, ethmoidal, and sphenoidal. Each part corresponds to the underlying bone of the same name. Floor: The floor consists of the palatine process of the maxilla and the horizontal plate of the palatine bone. Medial wall: This wall is the nasal septum, which is formed by the perpendicular plate of the ethmoid bone, the vomer, cartilage, and the nasal crests of the maxillary and palatine bones. The sphenoethmoid recess lies posterior to the superior concha and has the opening for the sphenoidal sinus. 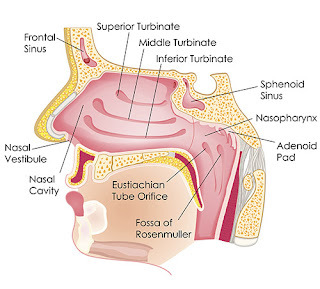 The superior nasal meatus lies between the superior and middle conchae and has openings to the posterior ethmoidal sinuses. The middle nasal meatus is longer and deeper than the superior nasal meatus. The frontal sinus communicates with the middle nasal meatus via the infundibulum, a passageway that opens into the semilunar hiatus (groove in the ethmoid bone). The maxillary sinus opens into the semilunar hiatus. An ethmoidal bulla (a round swelling formed by the middle ethmoidal cells, or air-filled cavities) is formed just above the semilunar hiatus. The middle and anterior ethmoidal sinuses drain into the middle nasal meatus. The inferior nasal meatus is found below the inferior nasal concha. The nasolacrimal duct opens into this meatus. Maxillary sinus: This sinus is located in the body of the maxilla behind the cheek just above the roots of the premolar and molar teeth. It’s shaped like a pyramid. It opens into the nasal cavity via the semilunar hiatus. Frontal sinuses: Found within the frontal bone, each of these sinuses is triangular in shape and runs above the medial end of the eyebrow and backward to the orbit. They open into the nasal cavity via the semilunar hiatus. Sphenoid sinuses: These sinuses are found in the sphenoid bone. Each opens into the sphenoethmoid recess. Ethmoid sinuses: The anterior, middle, and posterior ethmoid sinuses are located in the ethmoid bone between the nose and the eye. The anterior sinus opens into the nasal cavity by the infundibulum, the middle sinus opens into the ethmoidal bulla, and the posterior sinus opens into the superior meatus. Nerve supply to the external nose is provided by the infratrochlear and external nasal branches of the ophthalmic nerve and the infraorbital branch of the maxillary nerve, both of which are part of the trigeminal nerve (CN V). The olfactory nerves (CN I) pass through the cribiform plate of the ethmoid bone. General sensory innervation of the nasal cavity and the paranasal sinuses is from the ophthalmic nerve (CN V1) and maxillary nerve (CN V2). Blood is supplied to the external part of the nose by branches of the ophthalmic and maxillary arteries. The skin of the ala and septum are supplied by the facial artery. Blood is brought to the walls of the nasal cavity and sinuses by branches of the maxillary artery. The most important is the sphenopalatine artery, which anastomoses with a branch of the superior labial artery. Venous blood is returned from the nasal cavity by veins that accompany the arteries. Lymph from the nasal cavity drains into the submandibular lymph nodes and vessels that drain into the upper deep cervical lymph nodes.